After visiting the Elddis open day in September we ordered a Commodore from Leisure World at Catterick, a very good discount was given from the RRP screen price and a free mover thrown in. Did a bit more haggling to have TV brackets and added shelf pack fitted. News today from Catterick the Commodore has arrived and is being PDI'd tomorrow ready for collection on Monday. I have taken the smallest of HP from Black Horse over five years just to have some consumer protection after reading that is the best way rather than purchase outright. Booked a CCC site closeby for Monday, fingers crossed we can be back home by Tuesday with the van tucked up in our local storage compound. Hope it goes well, fancy a look at one ourselves. Hope all goes well,great choice of van hope it lives up to expectations we are awaiting delivery of ours due Feb,look forward to some positive feedback. Going to use this thread as positive and negative feed back over the coming months, it's mostly negative feedback that is recorded on forums and FB so hopefully we can have the good and bad points. Sold our late 2014 S3 Cartagena privately couple of months ago, it had no faults in two years apart from a loose window blind frame screw, the dealer tried silicon on it to no avail, I just put a slightly larger tapper in its place. Bathroom sink tap became loose in it's hole. Hopefully the Commodore will be as good. Congratulations I am sure you will enjoy it. When we collected our Cruiser we went to a site nearby to the dealer which was just as well as the darn thing would not unhitch from the car. We were not that familair with the BPW hitch and winding down the jockey wheel was lifting the back of the Jeep. As the Jeep was blocking the access road we had tor everse right back and phone the dealer. Naturally when they arrived, a quick lift and the caravan was no longer hitched to the car. There was a bit of a trick to disengaging the hitch which was different to the ALKO one. Hi Speedy,we are trading in a 2013 unicorn Madrid series 2 which like you we have had no problems with,we have everything crossed our luck continues. Some, if not most, of negative feedback on forums seems to come from buyers who have issues with their caravan and run into difficulties in getting the issues resolved by a dealer many miles from the buyer's home. We were not that familair with the BPW hitch There was a bit of a trick to disengaging the hitch which was different to the ALKO one. The BPW does have a different action to the Alko, we've had both in the past but will take a bit getting used to it again. The BPW hitch will not come off if the bellows are completely open so either reverse car slightly or if using the mover you could move caravan forwards slightly (only half inch required) and it will come off cleanly and easily. Dont compress bellows too much as then hitch will hit bumper when it comes off although the rubber boot should protect the bumper from damage. Sorry to hijack the post but as the OP is collecting soon I was keen he should see it as am sure he is reading this thread. 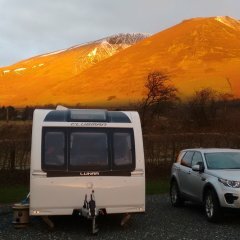 A brand new caravan which wont come off car could be disappointing/frustrating/time consuming plus a little embarrassing - been there and done it! Good luck with your new van and happy touring times ahead. yes had the same thing with unhitching on first tow. as said just a litle movement with mover and it comes apart easier. i do live on a slight hill so took some working out. The BPW hitch will not come off if the bellows are completely open so either reverse car slightly or if using the mover you could move caravan forwards slightly (only half inch required) and it will come off cleanly and easily. Dont compress bellows too much as then hitch will hit bumper when it comes off although the rubber boot should protect the bumper from damage. oh exciting !!!!! is it on time or late ? Was down for the 22nd December but with the dealer being closed for two weeks holiday it arrived on the 5th January, happy with that. ahhh so down to the dealer rather than Elddis ? trying to guesstimate if ours is on track for mid March !! Excellent stuff Speedy. We also serve who only stand and wait! Our Commodore is due Feb/Mar and I continue to build my PDI oversight strategy based on what you delivered owners report, so please keep it coming, good or bad. Your "part finance" option looks interesting. I wonder how many folk are trying that? We also went down the route of part finance. Any issues you let the finance company fight your corner. Best way to go, keep your money in the bank,finance company will sort any problems far easier and quicker. That does seem to be sadly the way to go, when I mentioned it to the dealer they agreed it was good for consumer protection and if I'm happy in a year or so with the van I can pay off the balance early with an interest reduction and pay a £10 admin fee. We have decided on 5 years as interest is very low. In the past it is on the 4th service that you seem to get a bill larger than normal when they find all sorts of things wrong except damp. A lot depends on the dealership. Would it not be better to not pay it off ie leave the finance in place for a long as possible then you have the security of the 'clout' of the finance company Behind you for as long as possible if you run into problems further down the line? Well this is all a bit of an eye opener. We were going to pay the difference in cash as it's only a few grand but I guess we could stick it on finance for the added protection. However, I'm wondering about the finance company's incentive to fight our corner if they only have a small stake in the game. I mean in the event of disaster they would only be interested in getting their bit back which the van would probably still be worth. Or am I seeing this correctly? Yes it certainly would be, but you have the option as with all HP of paying it off early if desired. It is not a case of "getting their bit back" as I understand it it's a case of they own the asset until paid for in full and it must be "fit for purpose" is the resoning if the s**t hits the fan.